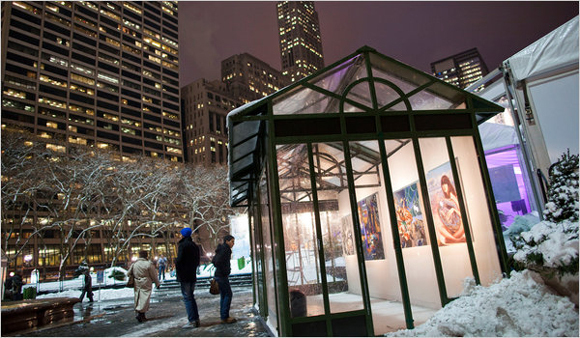 There are only two days left to view Battle of the Brush, the first outdoor painting exhibition to take place in Bryant Park. Visitors have been drawn to the bright exhibition kiosks on the park's Fountain Terrace, and so has the press. Carol Vogel, noted art critic for the New York Times, highlighted the exhibition in her Inside Art column last week, which included the above photo by Times photographer Michael Nagle. Read Carol's piece here, then head to the park and add a dose of culture to your dreary winter day. The exhibition is on view until 3:30pm on Wednesday, February 2 and includes paintings by artists Alison Blickle, Tom Sanford, Nicola Verlato, Eric White, Justin Adian, Anoka Faruqee, Patricia Treib, and Roger White.